"With my writing, I hope to inspire, enlighten and sometimes tickle a funny bone. The places I visit seem to let me know what they want for me to say. I am often left with a feeling of awe, and a deep sense of history and gratitude." We are all native to this planet, and the area where we live can feel part of us, like our blood or bones. In 2003, a group of writers from south Georgia and Florida's Big Bend came together to produce Between Two Rivers: Stories From the Red Hills to the Gulf. Susan Cerulean spearheaded the project, and she asked Janisse Ray and Laura Newton to join her in editing the book. The writers wrote about the places and people they loved, conveying a sense of respect, appreciation, and sometimes urgency. Donors contributed money, and the book was published in 2004. Immediately, Between Two Rivers became a hit, and enough copies have been sold to fund a new project. 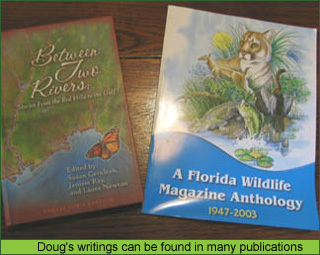 Doug wrote about the St. Marks River. Here's an excerpt from "Watery Thread Through Time:"
Some people yearn to hear symphonies in their head and compose great music. I yearn to hear a great river, and listen to its stories. 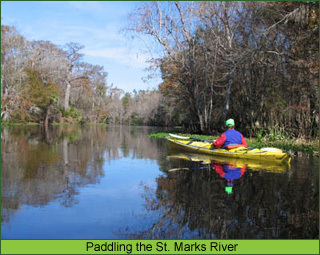 I often paddle the upper St. Marks River east of Woodville, north of Natural Bridge, late in the day. The river, divided into mirrors of shadow and light, seems to lure me on. A heron or anhinga, always a prominent bird, keeps moving ahead, appearing at bend after bend before flying off as I approach. 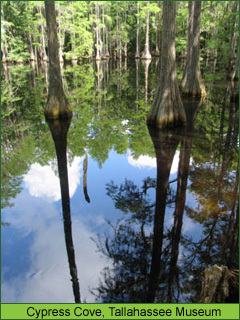 Fading sunrays illuminate centuries-old cypresses, weathered trees that have known the rap of ivory-billed woodpeckers and the fluttering wings of Carolina parakeets. I frequently pause to watch water bugs make their ever-changing designs on the water's surface. Every creature, eddy and arching branch of the St. Marks is a masterful work of art, worthy of appreciation. Once I paddle past moss-covered stumps of pilings from a long forgotten bridge, and pull my canoe or kayak over the first downed tree that blocks most boat traffic, there are few signs of people. That's when I really listen. A part of me begins to touch something very old. I sense mastodon, saber-toothed cat, Paleo hunter and dugout traveler, and wonder about their stories. How did native people regard this flowing lifeblood of water, the hues of which change from rich brown to red, yellow, and occasionally a clear blue, depending on rainfall? What did they call the river before 17th century Spaniards christened it St. Marks after one of their religious saints? I yearn for a longer bridge over the abyss of time. While barred owls give voice to the waning light, the presence of those vanished species and tribes seem as much a part of the river as the water itself. One Labor Day weekend, my cousin Tom and I decided to embark on a kayaking trip on this middle section of river. We dropped my truck off at the U.S. 98 public landing at Newport and launched two kayaks at the Gluckman's house. We enjoyed a leisurely three-hour paddle. Upon arriving at the public landing, we were shocked to find more than a hundred revelers in advanced stages of inebriation. Large sunburned men watched us with amusement. We felt like a pair of deer, with handsome racks, leisurely strolling through a hunt camp on Thanksgiving weekend. Tom and I looked for my truck. To our chagrin, we found it nestled among trees far from our original parking spot. It was blocked in by pickups and a loud horseshoe game. The ground was littered with trash, mostly beer bottles, which angered me particularly, since I had fought unsuccessfully for a bottle bill in Florida. A young man ran up to us. "Oh, is that your truck?" he asked nervously. I nodded. "We didn't hurt nothing," he blurted. "It was just in the way of the game." He nodded towards the wild-eyed men tossing horseshoes. By the excitement that each shot generated, I gathered that more than pride was on the line. "How did you move the truck?" I asked, incredulous. The man flashed a prideful smile. "About twenty of us just picked up the back end and rolled it by the front tires," he said. "It didn't hurt nothing." I chuckled. Two bare-chested men began rolling on the ground in a drunken brawl. Their grunts were momentarily drowned out by screeching brakes and blaring horns from the bridge area as someone tried to pull out in front of oncoming traffic. "You mind helping me get the truck out?" I asked, nonchalant. With the helpful man directing traffic and getting friends to move trucks, we managed to avoid thick mud, flying horseshoes, the brawlers, and a massive guy who swayed back and forth but stood his ground; he taunted us to run him over. On our slow drive past throngs of people along the landing road, some high school-aged girls called to us, "Got any marijuana?" Being two clean-cut 40-somethings, Tom and I could have passed for FBI agents. Instead, we merely drove on, wanting to somehow recapture the tranquility of the St. Marks River. You can learn more about The Red Hills Writers Project, sponsored by The Heart of the Earth environmental group, and to order your copy of Between Two Rivers here. Following his antenna signals, we began wading through palmettos and past arching live oaks, startling a black racer as it sunned in a small opening. The radio signal grew stronger. We paused. "Sometimes, a panther will start circling to see if you are some kind of threat," Mark whispered. "He may make a move when we stop." While Florida panthers have not been known to attack people, other than pioneer accounts in the 1800s, some western mountain lions have recently attacked and sometimes killed humans. This fact was not far from my mind. Drawing closer, we would move and stop, move and stop, all the while listening. Nothing. Only songbirds. The big male panther was somewhere inside the densest palmetto thicket I had ever seen. And close. Maybe thirty or forty feet. Maybe less. Yet, we could neither see nor hear him, or penetrate the great wall of saw-toothed blades and pointed palmetto fans. No matter how much I tried to be stealth, I snapped twigs and rustled palmetto fronds. Panthers, on the other hand, are generally silent and swift in pursuit or flight. Without radio telemetry, I knew our efforts would be like grade school students trying to teach trigonometry to a group of math teachers. Panthers are master hunters, and masters of hiding. Even with radio telemetry, we had to backtrack.